This is going to be a short and quick blog post. I would write later, but this is my last night in the hotel with wi-fi, so I’m not sure when I will have a chance to blog again. As I mentioned in the first paragraph of my Finfinne Diary of December 16th, our trip had a number of goals. I outlined four, but in my haste I forgot to mention one of them — the investigation of possible topics for documentary film projects. Towards that goal, in addition to meeting with girls from the Resources for the Enrichment of African Lives project that I mentioned before, our documentarian Jennifer Dworkin returned to the studio of Paulos Regassa with some of the Sandscribe Communications students and has spent some time later with the students themselves. We will also meet with the Gudina Tumsa Foundation tomorrow, and then most of our official work will be done. Stephen Greenwald has already left, and tonight I got to finally spend some time with Maya’s grandparents and other relatives. 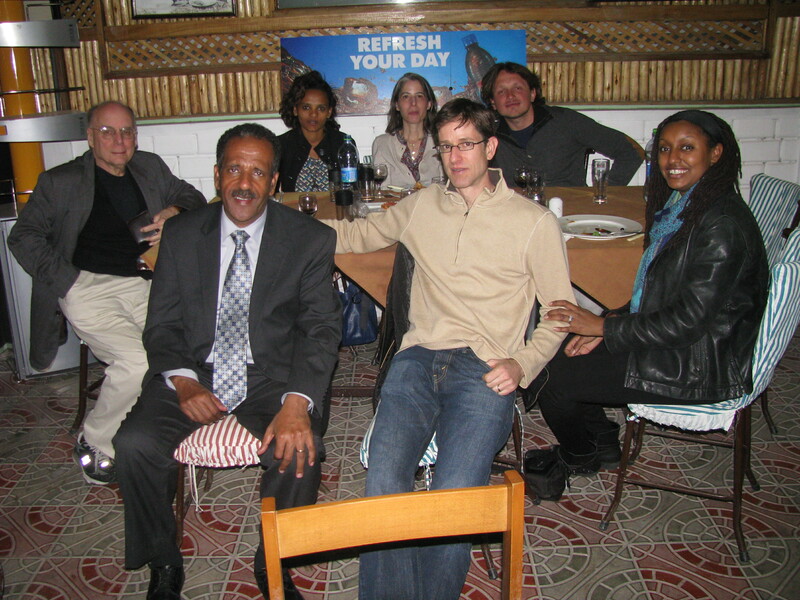 The previous night (Thursday) we invited the scholar Alessandro Jedlowski out to dinner with us again and also the young film-maker whom we had met at Addis Ababa University and whose film we had gone to the cinema to watch the night before (as I described in my blog post for 18 December 2013). Happily, my wife Maya, who had just arrived the night before, could join us also. Most of the past two days (Thursday and Friday) have been various meetings with a diverse group of government officials at various locations in the city. We had intentionally left Friday wide open on our schedule just in case something came up or to do a little tourism, but it ended up being our busiest day of the week. Possibly, after our public presentation on Tuesday, some word got around about our trip, or possibly just serendipity, but in any case, Dhaba got some calls from worthy individuals. Out of respect for those officials who met with us, I will refrain from mentioning their names or posting photographs here, but let me just say that we did get to see the inside of Parliament, which was cool. We have learned a lot about the current state of film and media in Ethiopia from all these meetings, and I hope we were able to contribute something useful as well and that they will lead to great things in the future. From here on, although I will continue to follow through with my research and the various goals of the trip here and there, I will mostly be spending time with Maya and her family, and we plan to travel west about 250 miles to the Wollega region where her family comes from. I don’t know if I will be able to blog again until I return on Wednesday.